A few decades ago, a friend (one Nancy Springer (Connor) took me along to her friend's cabin in the Adirondacks. She waxed eloquent about the sea kayaks, available for exploration of Franklin Falls Pond (the "ponds" of New York being rather larger than most lakes in PA). I snorted something about taking my snorkeling gear; floatin' boats were to jump off of to look at the sunken boats. I took my mask and fins, and discovered the visibility was approximately to my elbow. "Sooooo, what about those floatin' boats?" I got in one, and didn't get out of it for the rest of the week. By the next spring I had acquired nearly eighteen feet of bright blue plastic I dubbed "Mak-eh-nuk's Fin". "Mak-eh-nuk" is the Kwakiutl word for "orca", or at least, how it sounds to English speaking ears, from Eric Hoyt's book: "Orca: the Whale Called Killer"
Cultures with seals have legends of Sealfolk who take off their sealskins to walk on land in human form. A whale version of this legend is found on the northwest coast of North America (Kwakiutl, Haida and others); the Whale-folk take off their fins to walk on land... the fin becomes the boat. This inspired my central chracter (the one in the "swordwhale" logo), a northwest coast marine biologist/filmaker who also happens to be an orca "selkie". A wetsuit and scuba gear is the "sealskin" of the explorer of Planet Water. The small, seaworthy, agile, fast, efficient kayak is the "fin" that reconnects us to the feel of the waves, the wonder of what's around the next bend, the sound of seabirds, the hidden nest, the sudden surprise of fins surfacing at paddle length (dolphins, cownosed rays). A kayak is much like the horses I grew up on: an extension of your own body, you feel the shape of the water, the direction of the wind, the way the bottom comes up under you in the shallows. Like Horse, on land, the Kayak carries us on the Journey. 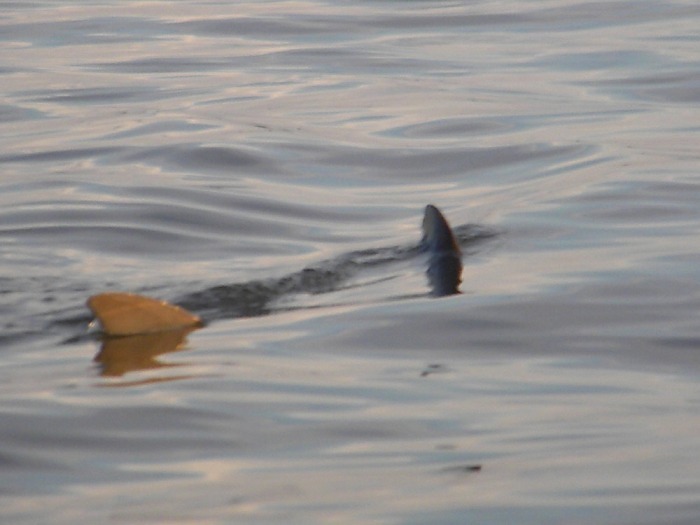 Here are a few of my favorite random shots over the bow of my sea kayak, Mak-eh-nuk's Fin. North of Chestertown MD, south of Elk Neck State Park, on the Delmarva Penninsula. The Sassafras empties into the Chesapeake Bay north of the Chester River. It is tidal freshwater, with waves to leap mid-river, quiet coves full of American lotus and wildlife, moon-curves of sandy beach, wooded shores. From York County PA, a day trip. Eastern Neck National Wildlife Refuge: lies at the mouth of the Chester River (undeveloped agricultural landscape and colonial town of Chestertown), in the north 3rd of the Chesapeake Bay. Awesome paddling, just salty enough for crabs, oysters and rays. Watch for osprey, eagles and waterfowl. A day trip from York County PA. The best little shop in York County, you can get great new or used (great deals in great shape) kayaks, gear, and experienced advice. 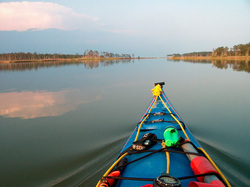 Or book a guided paddling trip (check out the pics and videos from kayakcam, bottom of this page). When the water freezes, you can buy some ski or snowboard gear too. Point Lookout State Park lies at the mouth of the Potomac River. Good camping nearby, quiet backwaters full of wildife, the river's mouth, and the vast stretches of the Bay. And a haunted lighthouse. A weekender. On the Susquehanna River, south of Wrightsville, across the river from Long Level (Lancaster side) a series of islands and sandbars create prime birding grounds. Look for tracks of herons, egrets, waterfowl and seabirds. Watch for eagles, and take a close look at driftwood, shells and tiny plants. If you can't get to the beach this weekend, this is pretty close! Photo albums and videos from paddling journeys in Mak-eh-nuk's Fin: click on the pics to go to the album.